Among all these mass brands storefronts, suddenly Too Cool For School materialized before me — hip, cool, artsy, different. I mean, hip, cool, and artsy are all over the place these days in Seoul. (Read: Garosu-gil.) But back then? TCFS, as K-beauty insiders call it, was fresh and new. The artistic packaging. The chic interior. The understated approach in stark contrast to all the other storefronts jam-packed with young women in short plastic skirts, accosting you with free sheet masks and pamphlets. Fast forward a decade. give or take, and wow, have things changed. TCFS? Now at Sephora. Granted, I haven’t loved everything from the brand. Their concepts are always cool. But in practice? Hit or miss. What isn’t a miss? Their egg line. Seriously, I LOVE their egg line. I’m picky about my skincare. My body care? I honestly could care less. And their Egg Cream Mask Hydration? Love, love, love. The sheet mask comes with a stiff net backing you don’t see in too many sheet masks. The mask, a fine microfiber, is totally drenched in essence. I really like the essence — it feels substantial without feeling sticky. The mask itself clings so well, it’s crazy easy to smooth it out once the forehead part has glommed on. The essence is silky, almost slimy (am I imagining the egg albumen and yolk, which are halfway down the ingredient list? ), but not at all sticky or in a bad way. It has a slight scent of … some sort of alcohol-like fermentation perhaps? But there’s no alcohol in this. Water, Butylene Glycol, Glycerin, PEG-32, Cyclopentasiloxane, Cyclohexasiloxane, Niacinamide, Glycereth-26, Caprylic/Capric Triglyceride, Dimethicone, Sodium Hyaluronate, Glyceryl Stearate, PEG-100 Stearate, Polysorbate 60, Cetearyl Alcohol, Acrylates/C10-30 Alkyl Acrylate Crosspolymer, Arginine, Cocos Nucifera (Coconut) Water, Albumen Extract, Egg Yolk Extract/Extrait de jaune d’oeuf, Myrciaria Dubia Fruit Extract, Hydroxyethyl Acrylate/Sodium Acryloyldimethyl Taurate Copolymer, Xanthan Gum, Dextrin, 1,2-Hexanediol, Phenoxyethanol, Panthenol, Sodium Polyacrylate, Ethylhexylglycerin, Hydrogenated Lecithin, Linoleic Acid, Ceramide NP, Camellia Japonica Seed Oil, Disodium EDTA, Fragrance. After 20 minutes, the mask looks significantly drier, though I still see some wet spots here and there. Thankfully, my face still looks wet underneath. The essence pats in nicely, though not quickly — enough to feel substantial. My first HA serum felt a little sticky on top as I pat in, but it eventually passes, and the rest of my regimen goes on fine with no pilling. Best of all, my neck feels extra smooth. (It must be the cyclopentasiloxane and cyclohexasiloxane — there’s a lot in this mask, one of the first handful of ingredients, though niacinamide closely follows.) That’s normally a minus in my book — I don’t like that overly slick, sort of suffocating feel of silicone in my skincare, and I usually find it doesn’t do much for my skin; it’s generally just a cosmetic feel thing, and it may even hinder actives from penetrating, or at least make it take longer. But for a sheet mask, I don’t mind as much. My face does feel bouncier, tauter, super hydrated afterwards, so I’m not complaining. At $4.80 per mask (if you buy the 5-pack), it’s better than a lot of sheet masks you can buy at Sephora. And for winter, when my skin is super dry, this is the bomb. So if you’re trying to build up VIB Rouge points, this is definitely a good investment. Your skin will thank you. Does that mean there aren’t better sheet masks for dry skin? Of course not. 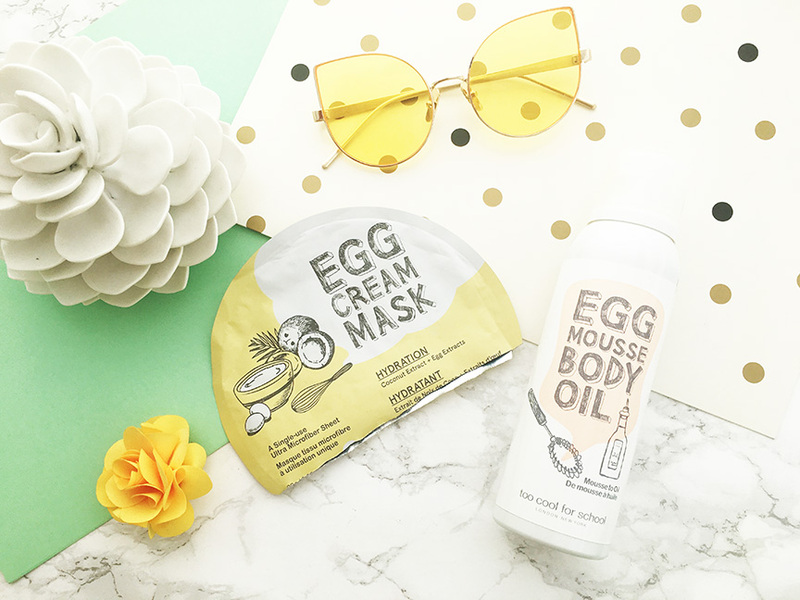 (My go-to right now is this sheet mask, a crazy steal for just $2 per.) But you can bet my cart will be full of the Too Cool For School Egg Cream Mask come VIB Rouge renewal time. It’s that good. I am so going to try these now! I kept seeing them at ulta and Sephora! These masks look like a dream. I definitely want to give the a try.